DISCLAIMER: THIS IS BOOK 3! IT WILL CONTAIN SPOILERS. READ AT YOUR OWN RISK!!!! Heaven picks up where Hades left off. Xavier and Bethany are deeply in love, and Xavier proposes. The world around Bethany and Xavier’s relationship begins to fall apart because of the decision they made and they have to go into hiding. Now married, they go to a college where they have to pretend to be brother and sister to stay safe. The characters from previous books make appearances along side of the Seven, the new “force to be reckoned with.” Bethany and Xavier have to overcome the odds in order to stay together. Let me start out by saying that I enjoyed Halo greatly. I thought it was a sweet story, and I had my favorite characters for sure. Heaven is the third and final book of the Halo series and I was excited to get my hands on it! I’m sad to say it didn’t live up to my expectations. I always hate writing reviews that come from books that have disappointed me, but it wouldn’t be right for me not to share with you exactly what I think. I felt like nothing happened in Heaven. Bethany, as a character, seemed to go the opposite way of developing. She acted like a kid at times, disregarding everything she believes in just to have her way. Xavier was one of my favorites from the beginning. I really enjoyed his character in Halo, but in Heaven it seemed like he was just a presence. I don’t know if that makes sense, but that’s how I felt reading it. For me, Seven weren’t the scary force trying to keep Bethany and Xavier apart. Jake was far better villain than the Seven and that’s kind of sad in itself. While I liked having a book that brought out some Christian values, Heaven wasn’t the best example of that. At least not to me. Xavier was a better example of a Christian than Bethany and that’s sad all on its own. She was the one to drag him down and I didn’t like that. In the end, there was no resolution. Gabriel and Ivy, who I enjoyed throughout the books, were just mentioned as a second thought in the end. It was as if the author forgot about them and had to throw them in. Also, some of the timing in the scenes were off and a lot of conversations were repeated unnecessarily. 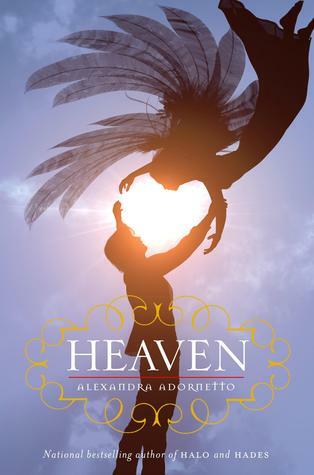 I read Heaven because I needed to have closure for this series. In the end, I ended up with more questions then answers. It saddens me to say so, but I try to be an honest reviewer because I would want the same for my books. If you’ve read Heaven, let me know what you think! I'm so scared of these books!! hhaa. The reviews are insane. Like, intense love or immense hate. I'm curious if nothing else!! Dang! Hades was wonderful and I'm curious what happened here? !